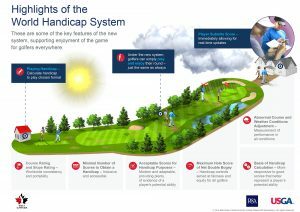 “We’re excited to be taking another important step – along with modernizing golf’s Rules – to provide a pathway into the sport, making golf easier to understand and more approachable and enjoyable for everyone to play. You can click right here for all the details from the Golf Canada website. “For some time, we’ve heard golfers say, ‘I’m not good enough to have a handicap,’ or ‘I don’t play enough to have a handicap,” Davis added. The current handicap system, despite some warts, is all we’ve had to work with. Subsequently, I think it has always been important to simply make the best of it. Again, it’s all we’ve had to utilize over the years. Your buddy, a ten-handicap, plays 150 rounds a year – 125 of those at his home course. Your other buddy is also a ten-handicap. He has a few favourite courses but is not a member anywhere and tees it up about 100 times a year at 80 different courses.